As the exoskeleton industry begins to pick up speed the number of dedicated to exoskeleton and exosuit events are on the rise as well. Here are some of the top must-go-to events for 2018. Don’t worry if you have missed some of them as most are reccurring, but do take steps not to miss the bigger events that are still coming up! ISO/TCC 299 Robotics is not dedicated to exoskeletons exclusively, but its Workgroup 2 on Personal Care Robot Safety and Workgroup 4 on Service Robotics have begun tackling exoskeleton standards. The meeting was held at the NIST headquarters in Maryland, US. For additional information visit Nist.gov. What began as a NIST terminology task force for exoskeletons has evolved into the ASTM (originally American Society for Testing and Materials) Committee F48 on Exoskeletons and Exosuits. F48 has five subcommittees that deal with design and manufacturing, human factors and ergonomics, task performance and environmental considerations, maintenance and disposal, security and information technology, and terminology. If you missed the first meeting you will have another chance in the first half of October of 2018. See more on the formation of F48 here, and a preview of the February meeting here. The U.S., China, Australia, and Russia are amongst some of the big governments that are actively pursuing military exoskeleton technology. NATO has no intention to be left behind. Find out more in our January preview. The Wearable Robotics Organization Conference 2018, WearRAcon18, is the largest wearable robotics event for the year. It brings exoskeleton developers, users, researchers, evaluators, regulators, and interested parties from across the globe. WearRAcon18 is the perfect event to build connections and foster relationships while staying on the cutting edge of wearable robotics development. Similar to the previous two years, WearRAcon18 will also include an Innovation Challenge where individuals and small teams compete in front of a specialists panel. Click here for a preview and previous coverage. Make sure to book a room right away to catch the discount rate (register through the WearRA site). The full schedule has been released and can be found here. Organized by the Human Factors and Ergonomics Society (HFES) the ErgoX Symposium has three goals. First, to provide an update on human factors, safety, and ergonomic research methods for exoskeletons. Second, to highlight related standards and technology. Third, to present stakeholders the types, applications, and potential advantages of exoskeletons. The intent is to build on the initial momentum of ASTM and WearRA and focus on the impact of exoskeleton technology on the user. For more, visit HFES.org. This year, the International Symposium on Wearable Robotics (WeRob) will be held in parallel with the International Conference on Neurorehabilitation (ICNR). WeRob has a more academic twist and is primarily focused on research and innovations. It is the premier avenue for learning more about EU exoskeleton research. Find out more on their website at werob.org. 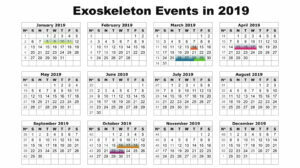 The above are only the dedicated to exoskeleton and exosuits events for 2018. In reality, many wearable robotics presentations are now making their way into medical device and manufacturing/ergonomics conventions. Updated: February 28th to include the Ohio Bureau of Workers’ Compensation Industrial Exoskeleton Workshop. Are you guy covering all of them with major highlights? Sadly, no. Until the Exoskeleton Report team can secures some funding stream to hire a full time employee we don’t have the resources to travel to more than two or three events per year. WearRAcon18: What to expect from the world’s biggest wearable robotics event!